In fact, I suggest getting one of these pumps even if you do have an air compressor available to use as they are quite handy and practical. Most good quality pumps nowadays have a built in guage making it very handy. I suggest checking the accuracy of the guage initially and from time to time to be sure you are getting the right pressure in the tires. Here are a couple of examples of pumps available. They can be purchased at your local bike shop. I want to emphasize that it is best to buy a good quality pump and not settle for some inferior pump at a lower cost. I don’t think you would regret paying more for a quality pump. I would also suggest that you talk to a local bike shop mechanic to get their recommedation as to what pump to buy. You could also research them online to get customer feedback. I am not making any recommendations as to what pump to buy. I am only showing these two as examples of what is available. There are lots of different ones out there. The first pump I have pictured above is a Blackburn Air Tower 3 Bike Floor Pump rated at 160 psi. To the best of my knowledge it is a good quality pump. The second pump I have pictured above is a ParkTool brand which normally they make pretty good quality stuff. However, the customer reviews of this pump are not all that impressive. That is surprising. Most pumps nowadays have a dual head on them so that either Presta or Schrader valves are accommodated. The pump I have is a Pedros Domestique air pump. It is a good pump, but I know that there are better ones available. In case you didn’t know it an innertube loses air on a continual basis so it is necessary to inflate them from time to time. That’s right … air leaks right thru the rubber so they are constantly losing pressure. The higher the pressure the more they leak down. It is important to keep your tires inflated to the correct pressure. You will get better wear, mileage, handling, and performance out of your tires as well as make it easier to pedal along since low air pressure equates to more rolling resistance. It is also important that you never over inflate your tires beyond what they are designed for. Doing so can result in destroying the tire and causing a major tire failure which could be disaterous at worst and leave you stranded at best. I once put about 10 psi more in a knobby tire I used for winter riding. About 10 miles from home I noticed something which wasn’t right in the ride … a pronounced thump of sorts. I stopped and got off to look. My rear tire was literally coming apart … separating from too much pressure in it. Fortunately I was only about a half of a mile or so from a local bike shop so I made it over there and got a new tire. The tire that had just gone bad would have lasted me for several years more if I had not over inflated it. WHEN IS .75 NOT THE SAME AS 3/4? If we were talking simple mathematics the answer to that would be simple enough. The fraction and the decimal are always the same. But in the world of bicycle tires it is an altogether different ballgame. The answer is no, it is not the same. I know … it sounds crazy and as far as I am concerned it is crazy. It is one very confusing messed up system which has been developed. When I was a kid it wasn’t this way. It was all pretty much straight forward and simple … easy to understand. I have written about this subject before. Click HERE to read about it. Just take a look at this chart below and you can readily see what I am talking about. It almost gives me a headache. Schwalbe has information on tire sizes HERE. I like their chart as it seems easier to read than some others I have seen. HERE is an article by the late Sheldon Brown about tire sizes. He has a section a short ways down the page he has called “Does Point Seven Five Equal Three Quarters?”. HERE is another article on tire sizes. As you can see the 451 inner tube is much larger in diameter than the 406 tire. Some of the sales people in bike stores don’t know this and will hand you a 451 inner tube even if you specify you need a 406 inner tube. It has happened to me. I got clear back home before discovering the sales person selected the wrong tube. I had to return to the store to get the right one. Now I look before buying it since I learned you can’t entrust the matter to the store. WILL THESE TIRES FIT MY RIMS? That is a good question. I wish I had the answer. Information like that would be nice to know. I suppose I could say … “your guess is as good as mine”, but I reckon that wouldn’t be very helpful. I have tried a few different times looking up information about tires and rims and pretty much concluded that I must be dumber than I thought as I couldn’t make much out of most of what I read. It just seems to get pretty technical and complicated. I find it quite challenging trying to make sense out of all of it. It was pretty simple when I was a kid, but thru the years man has managed to make it quite complicated. You can try your hand at it if you want. Perhaps you will have more success than I have had in the past. My best advice is to go ask someone who works with this and has some understanding of it. That being said, don’t be surprised if they don’t know of a certainty the answer to your question. But this much I know … more and more it seems as though people are moving toward wider tires on their trikes … trying to remake their trikes into “mini-FAT trikes”. I can understand and appreciate that, but hey, a rim can only handle so much additional width without concern of safety and performance. HERE is Schwalbe’s article on this. You can read the late Sheldon Brown’s article HERE. There are some formulas for calculation HERE. HERE is another good article on tire width and rim size. Here are some things I have learned. Some of it is just common sense and logic. Tires are designed to have a certain shape when they are properly inflated on the rim. If the tire is too narrow traction and stability when cornering will suffer. If the tire bead is too wide where is fits down into the rim the tire will be deformed from the way it was designed and the tread will be effected. Impact absorption will suffer as will control during cornering. Sidewalls can be more easily damaged and cut. A proper fitting tire on a rim will ensure maximum performance in cornering and traction as well as provide the least rolling resistance. Tires are designed to have a certain shape when properly mounted and inflated. When we modify things we can effect our safety in the performance and handling of the tire. A wider tire has less rolling resistance than a narrower one of the same “build” and air pressure. A wider tire will also help prevent pinch flats. Fat tire trikes have most definitely caught on and more and more are coming on the market. Those fat tires are nice, but they sure are expensive. And then there are the special wheels required to mount them … also very expensive. Many of us may think we would like to have a fat trike, but can’t afford to buy one. Maybe we struggle with justifying the expense. 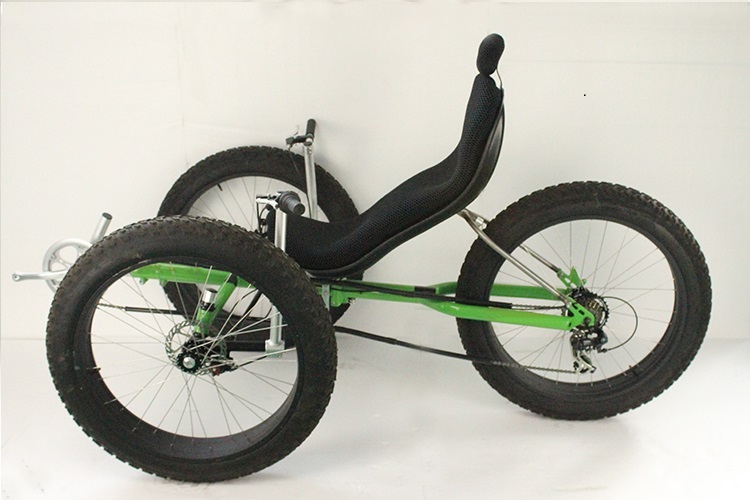 And even attempting to convert our existing trike over to a fat trike may be cost prohibitive … even if the frame would accept the wider tires and wheels (and it may not). Most of us know the terms “full”, “mini” and “micro”. Full is full size, mini is smaler than full and micro is smaller than mini. This can be applied to a lot of things including … (drum roll please) … “ta da!” … FAT tires. Yep, there is full fat, mini fat and micro fat. Full fat is said to be 26 x 4 so a full fat trike has 26 x 4 inch wheels and tires all the way around. 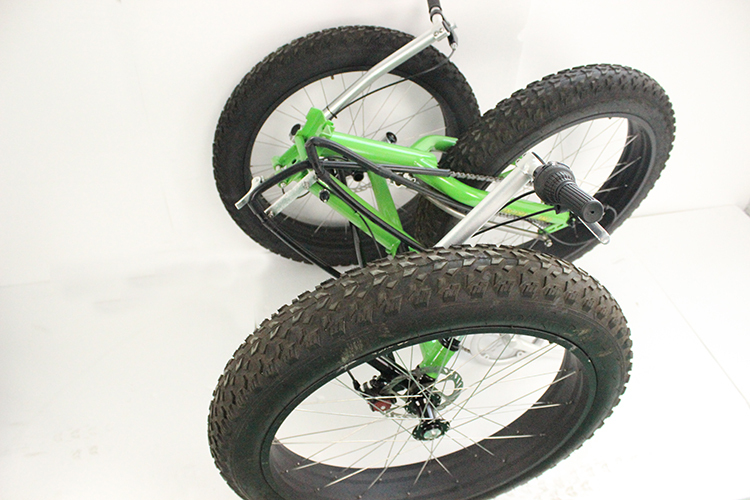 Mini fat is 20 x 4 so a mini fat trike has 20 x 4 inch tires and wheels all the way around. Then there is micro fat which is 20 (or 26) x 3. Yep, I said 3. It definitely is not a full fat of 4 inch tires and rims, but 3 inches is definitely larger than everything else out there I know of commonly found on tadpole trikes. It looks impressive when compared to more conventional/traditional tires normally found on tadpole trikes. Here is one alongside of a Schwalbe 2 inch Big Apple, a tire many of us are familiar with. As you can see there is considerable difference in both width and height. So … Want a FAT trike but can’t afford one? There may be hope for you. Converting your standard tadpole trike into a Micro-FAT trike may be as simple and low cost as replacing the tires and inner tubes. Yep, I am talking about using your stock rims to mount these monsters on. At least it is my understanding that this can be done safely and that they will still perform properly. I would strongly advise anyone considering this to first check with a professional mechanic or the bicycle tire manufacturer to be certain this will work and will be safe. I am talking about using these 3 inch tires on your standard stock rims. I am only able to go by what some trike owners report and that is that they are successfully using these 3 inch tires on their stock rims. Warning- Rims are designed to use tires within a certain range. Trying to mount too narrow or too wide of a tire can be a problem and even dangerous. I want to make it clear that I am not suggesting or saying it okay to mount these tires on stock rims. I am only reporting that some have done so and claim they haven’t had any problems doing so. I want to make it very clear that it is possible that these larger width and height tires may not fit on your trike as far as having the needed clearance in the frame. So before spending money ordering these tires and tubes this needs to be known. I don’t have any way available to tell you whether or not they will work on your trike. You are on your own. Some trikes will handle them okay while others won’t. The best advice I could give it to look at your current tires taking note how much clearance you have available on the sides of the tires as well as the front side of the rear wheel as these 3 inch wide tires are considerably taller than the tires normally installed on a tadpole trike. That means they will come forward further into the frame as well as be wider. So if you already find you don’t have a lot of room left over between your stock tire and the frame you may not be able to install these larger tires. As you can see in the picture above this trike doesn’t have hardly any additional room available for a larger diameter tire, especially on the bottom most part of the frame. Also keep in mind that even if they do fit they will change some things from what you are used to. For instance most likely your turning radius will be effected as these tires would rub on the frame sooner not allowing the wheels to turn as sharply. These Kenda Flame 3 inch tires are available in 20 x 3 (76-406 ISO) diameter and, if needed, 26 x 3 (68-559 ISO) for the rear tire … although you may want a different tire on the rear to provide better traction. (They are also available in 24 inch.) It is my understanding that 20 x 4 inch inner tubes should be used in the 20 inch tire and 26 x 4 inch inner tubes in the 26 inch tire. The tire is listed as 20 or 26 x 3 but it only measures about 2.75 inches according to a picture of it online as well as what I have read about it. I don’t know if using a 4 inch inner tube will cause the 3 inch tire to increase in girth when inflated more so than a smaller inner tube would. Above is a picture of the Kenda Flame 3 inch tire. You can see it doesn’t have much of a tread pattern as far as aggressive traction like a knobby tire has. And it is not available in any other tread pattern. So off road use would be limited in the realm of traction. That is why I mentioned that you may want a different tire on the rear. If you don’t ride in mud or other surfaces or areas require superior traction then this tire may be satisfactory for your rear tire. I am quite sure it would not suffice for me. The best price I found on a 26 x 3 inch tire is $29.57 with free shipping on excelcycle.com . There are also other brands of tires available but I don’t think you can buy them for anywhere near this price. That being said, take a look below. I did find a Vee Rubber 26 x 3 inch tire (pictured above) on sale for $26, but it showed currently out of stock. You can, however, submit your email address to be informed when they have them back in stock. It is quite similar to the Kenda Flame tire. Just one 4 inch FAT tire costs over $100 and the 4 inch tubes cost about $15 each. You can buy three of these 3 inch Kenda Flame tires and three of the 4 inch inner tubes for about $100. So if this will suffice for you you can see it is definitely a very inexpensive way to go. Keep in mind … you are only gonna be “sorta fat” with this set up. I want to mention here and give credit to a fellow triker for enlightening me to this as he did this with his trike and swears by these tires for winter riding. He says he inflates them from 10 to 40 psi. Here is a picture of his trike with the 20 x 3 inch Kenda Flame tires mounted on all three stock rims. He reports that they do great riding in/on snow. In installing these large tires there may be a concern of clearance and definitely most fenders that may currently be installed with have to be removed and remain off. HERE is an article entitled “what are the pitfalls of converting to a micro fat trike”. One thing which just popped into my head concerning going with a wider tire like this on the rear wheel is the clearance of the chain. On my trike even with 1/4 inch wider tires than stock my chain is very close to the sidewall of the tire. If you ride in winter weather where you deal with snow and ice you probably already know that standard tires just don’t cut the mustard. For those of you who are not Americans you probably don’t know what I am talking about when I say “cut the mustard“. It simply means “to succeed” or “to come up to expectations”. Nope, a standard tire will just spin with no traction. One needs a tire that has good traction and “gets ur done”. Different people come up with different means of obtaining traction. Some continue to use their standard tires, but add some sort of mechanism to it to gain extra traction. One such item is plastic cable ties. I don’t personally think much of this for the simple reason that they break and fall off littering our earth as the rider goes on his merry way usually completely unaware of this. I have never tried them, but I can’t imagine them doing much to gain much traction. One can also use tire chains although just like using them on a car or truck they are not very practical for long term use unless one is constantly on snow or ice. They are rough riding, noisy and wear out quickly (prematurely) when riding on dry pavement. The ones I found online are more expensive than those for a car or truck (at least what those cost the last time I bought any). Some people make their own. Another option is the use of studded tires. Some people swear by them. If you ride on ice I think they would be most practical. However, if you ride on snow then I think there is a better option. Besides riding on dry pavement with studs wears them out prematurely and is costly. And they too are a bit noisy on dry pavement. Here is what I use and find them perfect for my winter riding. I have found that not all knobby tires are created equal. Some ride better than others. Some get better traction than others. Some offer the best of both. I really like the current one I use pictured below. It is a Kenda tire and was under $20 at a local bike shop. Of course, none of these traction options will last as long as they could and would if they were only ridden on snow and ice. Dry pavement riding will wear any of them out quicker. Lower pressure in tires works better for traction. My knobby tire is only a 40 psi maximum tire. I personally only use a “winter tire” on my rear wheel for traction. My front tires remain standard tires I run year around. Of course, they don’t offer as good of traction on the front as a winter tire would, but I get by just fine. I happen to have two rear wheels for my trike so I just keep the standard tire on one of the wheels and the knobby tire on the other. Then I simply change the wheels back and forth instead of the tires on the wheel. That makes it easier and quicker. TIRE LINERS – DO THEY WORK? Tire liners … do they work? Well …………………………….. yes and no. Once more it all depends. I used to use them and as far as helping prevent externally caused flats, yes they work. However, I and a couple of friends who also used them found that they caused flats internally. Also the service dept. manager of a local bike shop has told me that he agrees that they do indeed cause internal flats and thus won’t use them or recommend them. Now there are things which can be done to help prevent this from happening. Unfortunately we did not do any of it so we got occasional flats as a result. I would think that there should not have to be any thing done extra such as this for the tire liners to work properly and not cause internal flats. Now that I use the best tire money can buy I no longer use tire liners as I don’t need them. That being said when I first switched to the Schwalbe Marathon Plus tires I installed the tire liners initially as I already had them and had been using them for a few years on all the various tires I had tried previously. I thought it would be a good idea to have the extra measure of protection. Big mistake! I got about three flats over a period of a few years. All were internally caused flats. When I replaced the inner tubes I removed the tire liners. I have not had any flats since. So my advice is if you are going to use a regular tire prone to getting flats the tire liners are a good thing. If you are going to use them either sand the end of the tire liner where it overlaps itself to remove any sharpness or use duct tape to help protect the inner tube from any sharpness on the end. Personally I would do both … sand the end and use the duct tape. And be sure the end is rounded as this will help with the edge the inner tube comes in contact with. Lastly with or without tire liners I highly recommend using a generous amount of talcum powder inside the entire surface of tire and on the entire surface of the inner tube to reduce rubbing and abrasion which cause ‘internal’ flats. Put the talcum powder inside of the tire after the tire liner is in place. Definitely there is “abrasion” which occurs when tire liners are used. Take a look at this picture. You can plainly see the outline of the tire liner on the inner tube. Notice the sharp line of the end of the tire liner where it overlaps itself. Again, using duct tape on the end will greatly reduce this. As to the use of duct tape some say to put it over the end which overlaps. Some say put it on both ends. I see no reason to put it on both ends as it is only that which is in contact with the inner tube which is a concern. I would only put it on the overlap area. Here is one way to do it … wrap it around the top and bottom of the tire liner and then trim the duct tape to the rounded end shape. I wonder if it would not work better to just place a piece of duct tape over the overlap once the tire liner is in place inside of the tire. That way there would be less thickness at the overlap so that the overlap would not protrude out as far into the inner tube. I see no advantage to having tape on the bottom side of the tire liner since it is not in contact with the inner tube. Also the tape on the overlap would help hold the tire liner in position inside of the tire. The end which overlaps tends to want to drop away from the rest of the tire liner once it is up inside of the tire so I think it would be very helpful to place duct tape over the overlap. To the best of my knowledge there isn’t all that much difference in quality and protection offered between the various brands of tire liners. I have read that the Kevlar liners should not be used as they don’t work very well. Stick with the plastic type such as Mr. Tuffy, Rhino Dillos, Stop Flats 2, Zefal, and Slime. As you can see in the picture above they are pretty tough. I think that with the exception of Rhino Dillos all of the tire liners come packaged all rolled up tightly in a small coil/roll. In doing so the inside end is all curled up and presents problems when trying to work with it to install it. So because of this I recommend buying the Rhino Dillos as they are packaged so that this doesn’t happen. They are rolled up in a larger diameter. If you buy one of the other brands it is best to take it out of the packaging and hang it up by the small inside curled end (if it is one rolled from the end) so that it can straighten out for a day or two before installing it. If it is one rolled from the middle like pictured below then, of course, you should hang it from the end (either end). Again, my thinking is the worst way of packaging these tire liners is to fold them in half and then roll them up like the red one pictured above. If I were buying any I would steer clear of any packaged like that. I myself have only used Mr. Tuffy tire liners, which is the originator of tire liners. They are made of made of durable, lightweight polyurethane. They also have what they say is a lighter weight product for those who are weight conscious/concerned. They claim that their liners will not cause tire or tube damage. I take issue with that as I consider causing internal flats as “damage”. Whether the hole is the result of a puncture from the outside or abrasion on the inside it is still damage and has the same consequences … a flat and a destroyed inner tube. Tire liners come in different widths since tires come in different widths so be sure you get the correct width for the tires you are using. They also come in “XL” for FAT tires. As to installing tire liners you will find different methods and suggestions ‘out there’. Some say to remove the tire and inner tube completely off of the rim so you can install the tire liner inside of the tire off of the rim. That is the way I have always done it. Some say to leave the tire and inner tube on the rim and just remove one side of the tire off of the rim so you insert the tire liner between the tire and inner tube. Some say to remove one side of the tire off of the rim and remove the inner tube. Certainly it can be accomplished in any of these ways. It is important, of course, to ensure that there is nothing sharp inside of the tire or rim before installing the tire liner. That is best and easiest accomplished by removing both tire and inner tube off of the rim. It is also important to be sure the tire liner is centered inside of the tire and that the inner tube is installed correctly with no twists or other abnormalities. I found it interesting that their instructions say to remove any debris found inside of the tire casing before the inner tube is removed. How in the world are you supposed to check inside the tire casing without first removing the inner tube? DUH! I personally much prefer to take the tires completely off of the rims to install tire liners. Doing them while still on the rim one can not nearly as easily tell where the tire liner is positioned as far as getting it centered in the tire. Of course, no matter how one goes about it there is always the chance that the tire liner will move out of position during final assembly and re-inflating the inner tube. Another good reason for removing the tire completely off of the rim is one can much more easily and thoroughly examine the casing of the tire and do anything needed to ensure the tire is fit and ready to use. The side of the tire liner that has the extra layer of material bonded to it (it is usually darker color like shown above in the picture) goes outward toward the tire. I watched several videos on installing tire liners and quite frankly I was not very impressed by any of them. I settled for this one to use here. and not be concerned about flats. And it is great to get such phenomenal mileage out of the tires as well. I recently came across this video while looking for videos about tire liners as I have an article I have written on tire liners which will be published as the next article after this one. This video mentions tire liners, but it covers a whole lot of things. As for me I am going to continue using the best tire money can buy and not concern myself with flats. What kind of mileage should we get out of our tires? What should we expect? What is typical? What factors affect the mileage we get out of our tires? When should we replace our tires? Is it safe to ride on a worn out tire? I will attempt to address these questions and more in this article. * the tire itself and how it is constructed and the material (rubber compound) used. In short, not all tires are created equal. I am sure there are other factors I have not thought of. I myself have gotten as little as 200 or so miles out of a brand new tire and as much as over 14,000 miles out of a tire. Obviously only getting a couple of hundred miles out of a tire is a bummer. And just as obvious, getting over 14,000 miles out of a tire is fabulous. The 200 or so miles was the result of sidewall damage when I hit something. The tire was a Schwalbe Tryker tire which has very weak sidewalls which damage very easily. If I were to have done the very same thing with the tires I use now I don’t think they would have been phased as they are amazingly tough. Like I said, not all tires are created equal. Trikes, unlike bikes, don’t lean when turning. (Not unless you have a lean steering trike … which few of us do.) Because of this rubber is “scrubbed off” of the tires, especially the front tires, when riding. And this can be rather significant if the rider is a “hotdogger” (aggressive rider in fast cornering). Front tires on a tadpole trike will wear out faster than the rear tire. Other damage can happen to a tire which shortens its life. Hitting a hard bump or hole can destroy the tire and cause a bulge or deformity to occur. Depending upon how badly the tire is damaged you might be able to ride on it for awhile longer, but I would definitely suggest keeping a close eye on it. Sometimes a tire can be “booted” to extend its life some. However, it is always best to replace a tire which had such damage. BTW, if you hit a bad hole or bump you should also check the rim and spokes for any sign of damage or loosening. Cracking in the sidewalls of tires can occur either from riding with underinflation or aging or both. Cracking can also be caused by overinflation. With Schwalbe tires cracking of the sidewalls doesn’t seem to be nearly as common as tires of yesteryear most of us grew up with. I can’t speak for other brands as I don’t use any other brands and therefore have no experience or first hand knowledge concerning them. As to answering the questions about when a tire should be replaced and if it is safe to ride on a worn out tire to some degree I would have to respond once again by saying “it all depends”. I do not advocate riding on a worn out tire. If you use tires that don’t have a protective liner built in I definitely would advise against riding on such a tire when it is worn out and the “insides” are starting to show thru. It could even be the inner tube starting to show thru and even if it is not yet it could quickly do so if a person continues to ride on such a tire. It is very dangerous as the tire could suddenly and catastrophically fail. That could result in a very serious accident at worse. At the least it could leave you stranded unless you happen to carry a spare tire and inner tube with you. Most of us don’t carry spare tires along when we ride (although many of us do carry one around our middle of our bodies). 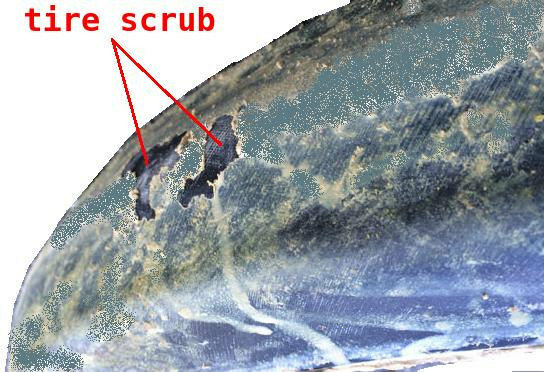 In the picture at the start of this article you can see a worn out tire with the blue protective liner showing thru. Some tires have green liners. Some have reddish liners. Some have no protective liners at all. If you use tires which have protective liners built into them then you are not in nearly as much danger when the tire shows wear and the liner is showing thru. Truthfully you could probably ride quite a few more miles on such a tire and be perfectly safe. Most definitely my advice is to replace the tire as soon as possible and by all means keep your eye on it if you continue to ride on it in such a condition. I myself have ridden a couple of hundred more miles or so on a tire which has started showing the protective liner … more than once. There was no problem at all in doing so, but I don’t advise doing so. If, however, the black rubber of the outside of the tire continues to quickly disappear and more and more of the protective liner shows thru it can eventually reach the point that it would be more and more of a concern to continue riding on it. The protective liner is not intended to be what contacts the riding surface. Tires are constructed in various layers and are integrated together giving them their strength. With high psi air pressure inside of them trying to force its way out once a tire is worn like this it could conceivably fail. So don’t take advantage of the fact that the tires are well constructed. Replace them in a timely manner when you spot this sort of wear. There isn’t much left which is holding the tire together when it gets like this. It is dangerous to continue to ride on a tire that is worn this badly like pictured below. Depending upon the tire the mileage obtainable out of it even in the best of circumstances will vary some as tires are made different from one another. Some have a soft rubber compound that just doesn’t wear as good as a tire with a harder compound. Of course, a softer compound will provide a smoother softer ride. There are trade offs in all of this. I could be wrong about this, but I think that a low pressure tire is not likely to provide as many miles as a high pressure tire all things being equal otherwise. Schwalbe Tire Co. has a webpage with information of tire wear. In general Schwalbe states that their non Marathon tires should get 1242 to 3106 miles (2000 to 5000 km) while their Marathon family tires should get 3728 to 7456 (6000 to 12000 km). They state that the Marathon Plus tire should get “much more” than 6213 miles (10000 km). The lowest I have ever got with Marathon Plus tires is around 7500 miles and as I have already been saying the best is 14,144 miles. That was on the rear. On the front the best I have got is 12,278 miles. I think I would have to attribute the phenomenal mileage to the fact that I have slowed up considerably the last 2 or 3 years due to my knee joints getting worse. In slowing up I am not experiencing as much tire scrubbing in hard fast cornering. I have written several other articles about tires previously. Click HERE to read them. As much as I love Schwalbe tires and most especially the Schwalbe Marathon Plus there are other tires available for our tadpole trikes. Among them are Vee tires. Vee Tire Company makes several different tires including FAT tires. They have over 30 years of experience in the tire manufacturing industry. They make tires for automobiles, motorcycles and bicycles. In addition to their website they have a Facebook page. Their email address is: info@veetireco.com I see that they are headquartered in Atlanta, Ga.
technology. The MK3 is a timeless BMX classic whose performance does not disappoint. smaller towards the center for the ultimate speed and traction. Obviously these tires are designed for bicycles (which lean when turning) and not for trikes. That is not to say they can’t be used on a trike as nearly all tires used on trikes were designed for bicycles. The only exception to this I know of is the Schwalbe Tryker tire which was designed specifically for trikes. Zilent features special compounds for a low rolling resistance while its state of-the-art construction provides high load capacity and added strength for flat resistance. Its innovative tread makes this a quiet tire and offers angled super grip for revolutionary cornering capabilities. weather conditions as the water grooves also double as traction for loose terrain. Smooth enough to kill the street and just enough bite to ride the dirt. The Capsule was designed for all three surfaces — street, dirt & ramp. 100 psi has never felt so good. That being said I find confusion … their webpage shows 2.25 while elsewhere I found 2.35 instead of 2.25. One place on their website shows 100 psi while another shows 65 psi. A word of caution … when ordering 20 inch tires make sure they are 406 and not 451. Recumbent wheels are 406 while BMX bicycle wheels are 451. A 451 tire is much larger in diameter and won’t fit on a recumbent wheel which is 406. The picture below shows a 451 inner tube in a 406 tire. As you can see there is too much inner tube to fit inside the tire. My understanding of the sizes is as follows: a fractional size such as 20 X 1 3/8 is a 451 while a decimal size such as 20 X 1.5 is a 406. So as long as the size is shown in decimals it should be a 406. I have not studied in great detail all the different tires Vee Tire Company offers and therefore I don’t know all the different tires they have which will fit on a tadpole trike. If you are interested in their tires you will have to research it yourself to be certain the tire you have in mind will fit and perform satisfactory. Some of their tires only come in larger diameters and not in 20 inch. As far as I know the ones I have featured above all are available in 20 inch sizes. VEE tires has a .pdf webpage which lists all their tires and has the size shown (406) for those tires which will work on a recumbent wheel. It is on page 37. Just look under the column ETRTO to locate 406. By the way, even if the tire is a 406 there could possibly be a problem width-wise if you go too narrow or too wide. If you are not certain check with someone knowledgeable of such things. BTW, as I stated early on … they also make FAT tires which I believe some are only available in 26 inch and others are available in both 26 and 24 inch. They are available in “snowshoe”, “speedster”, “bulldozer”, “hillbilly” and “Vees” (two different patterns). With the exception of the Speedster all the others are knobby tires with varying tread patterns. The H-Billy (shown on right below) is the most aggressive knobby among them. Schwalbe has become the best selling bicycle tire in Europe and for good reason. Like Tony the Tiger says … “They’re Great!!”. Most trike manufacturers install them on their trikes in the factory. 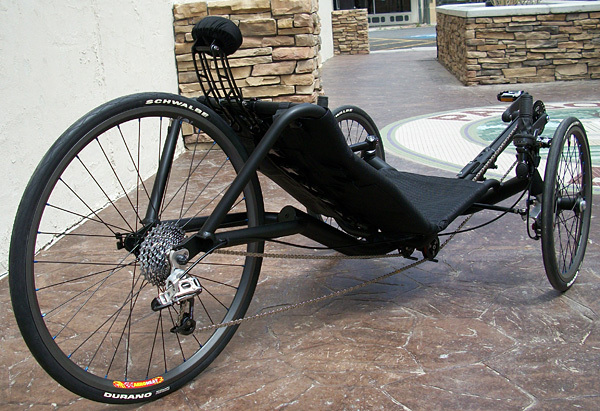 Recumbent wheels are not as commonplace as conventional diamond frame bike wheels so we don’t have as many tires available to choose from as they do. However, we do have quite a few and as people are individuals we don’t all like or want the same thing. Some people want a tire they consider “fast” and agile while others want a tire they consider comfortable riding. Others like myself want the best tire I can buy … one that offers great performance, wears incredibly long, rides comfortably, handles great, and is practically flatless. Of course, those with FAT trikes only use FAT tires. I have not yet seen a set of Kojaks installed on a FAT trike. Although this video below is produced by ICE trikes it is about the choices of Schwalbe tires. HERE are the Schwalbe recumbent tires available to choose from. They include their best seller Marathon Plus as well as Marathon, Marathon Supreme, Marathon Racer, 3 different Big Apple tires (Raceguard, K-guard and Big Apple Plus), Kojak, Durano, Durano Plus, Tryker, and two studded winter tires one of which is known as Marathon Winter and the other is a lower cost tire they simply call Winter. If there are any other recumbent tires Schwalbe offers I am unaware of them. I thought that since I am writing about Schwable tires I would once again mention and provide a LINK to to German source where I get my tires at incredible savings over those prices found elsewhere. Make sure you use the selections near the top of the webpage to select your language, shipping destination and currency. I have always received great service from this company. This link is to their 1.75 x 20 inch 406 Marathon Plus tire. This method is commonly referred to as “ghetto tubeless”. There are gobs of videos online about this subject. Those who have a hankerin’ to go tubeless have plenty of information available to help them accomplish this. If I understand correctly it is recommended that you use an inner tube smaller in diameter than what the rim calls for. This is so it is a snug fit on the rim. There are various sealant products on the market. Probably the best known one is Slime. I personally have never been impressed with Slime and can’t recommend it. The Stan’s NoTubes Tire Sealant is probably the one most recommended. I wonder if going tubeless would prevent air leakage like occurs using tubes. It would be nice if the tires held air pressure and would not need to be pumped up every few weeks or whatever. I have not gotten into this, but I am guessing that depending upon the frequency of punctures and the size of those punctures sealant inside of the tire will be lost thru the punctures. In time I am pretty sure that it would be necessary to add more sealant inside the tire. An injection device is available to add more sealant thru the valve stem. According to what I have read Stan’s sealant lasts 3 to 6 months once inserted inside of a tire. I would think that using a sealant like this would result in the sealant setting up inside the tire to where it needs to be removed before adding more. That would be a royal pain. I may even give this a try myself someday. However, I doubt very much if I would change to another tire as I really love these Schwalbe Marathon Plus tires. The fact that they ride nice, handle good, resist damage (including cuts) and wear so incredibly long is reason enough for me to stay with them. I like having maximum value and service for my money and the Marathon Plus tires deliver. I would guess though that in order to use them I would have to go the route of tubeless valve stem instead of the ghetto tubeless as I don’t think there is anyway I would be able to install the Marathon Plus tire using an inner tube sticking over the rim. For as long as I can remember I have heard and read that the higher the air pressure in a bike tire the better it will roll … meaning faster because of less rolling resistance. Along with this it was believed that narrower tires do better than wider tires when it comes to the speed they are capable of. Well, now it has been proven that this is false. Yep, now they are saying that we can run wider tires and at lower pressures without encountering a reduction in the speed we can obtain as well as the effort needed to propel ourselves along at those speeds. HERE is an article about this subject written by Jan Heine on his blog. Personally I have a difficult time accepting this. My own experience is that the same tire at a lower pressure rolls less easily than it does at a higher pressure. I can detect a lot of difference between the pressure as it takes more effort to pedal and I can’t go as fast when the pressure gets down too low. And I am talking about staying within the minimum and maximum pressure rating. It really is difficult to argue against scientific studies, but I am not buying into this just now. So what about you? What do you think? Your feedback is most welcome. Leave a comment. What determines speed capability … how fast you can go? Well, certainly there are various factors to take into consideration. The most obvious factor I would think is the rider … what they are capable of physically. Another factor is weight … both the weight of the machine one is riding as well as the rider’s weight and any extra weight one might carry along. Yet another factor is gearing. For higher speeds one needs taller gearing as a rider can only pedal so fast. Of course, there are other things such as air resistance (even with zero wind), head wind, and terrain (level vs. uphill, paved vs. unpaved, etc.). These are all contributing and limiting factors. But lets say that one is riding on level ground which is smoothly paved and there is no wind whatsoever … meaning that there are no factors in that last group which effect the outcome of the speed obtained. What else effects the speed? What has been left out? What about the tires? Do they make a difference? Of course they do! They can make a considerable difference. As is the case with many things tires are a science in and of themselves. The engineering and design of tires matters a great deal if one is out to get the most speed possible. TESTING has been done to determine which tires perform best. This testing was conducted with bicycle tires such as those which are used on a diamond frame road bike. That being said, understand that when we are talking about tadpole trikes the exact same tire isn’t likely available for our recumbent trikes. Very few tires listed in the TEST RESULTS are tires we can run on our trikes. In fact, I think there is only one although I am not certain about that. That being said, much of the test results doesn’t apply. And that being said, still we can glean some useful facts and understanding about this subject. It is about “where the rubber meets the road”. 🙂 The two main things I noted in this are: 1) air resistance (mainly the rider’s body going thru the air) is the number one factor followed by 2) the rolling resistance of the tire. And they report that “narrower is not necessarily faster”. As to air resistance we have a definite edge over the “roadie” and the more “recumbent” (reclined) we are the more advantage we have as air flows over us much more so and easier than the roadie. So that leaves rolling resistance to deal with. This is something which has been discussed a fair amount in the past. Tires do vary in the realm of their rolling resistance. Can recumbent tires compete with those tires listed for the road bikes when it comes to rolling resistance? I can’t answer that, but my guess is probably not … not when we are talking about the really high scoring tires. Most of us on tadpole trikes are running Schwalbe tires. In this test the only Schwalbe tire listed which is available for our trikes is the Durano and it scored dead last in the test results. I would further guess that somewhere testing has been done and the results are available for tires used on recumbent bikes and trikes. Perhaps if one could find such results they could be compared and we could know where we stand as far as the tires we have to select from for our trikes. I think it is a no brainer when it comes to which machine is faster on a level smooth surface with no wind … the road bike will easily win over a tadpole trike. And why shouldn’t it? It has nearly everything going for it … much less weight and less rolling resistance with only two wheels. A bicycle (not the rider’s body) with two wheels in line (one behind the other) has less air resistance than a trike with three wheels … none of which are in line with the other. Each wheel has it’s own rolling resistance added to the equation so 3 wheels have more rolling resistance than two. If your toe in setting is off you can wear out a set of tires really quick. I know about that from personal experience. When I first bought my Catrike Trail the dealer had set the toe in and got it way off … an inch off. As I rode it something didn’t seem right. It didn’t handle as good as it should and it seemed harder to pedal it than it should. In just 30 miles the brand new tires were junk … with holes worn in them much like the picture above. That was a case of extreme tire scrub. You can read more about this important matter of proper toe in setting HERE. Fat trikes rule! … off the road anyway. I had planned on creating another article about fat trikes, but upon looking at what Steve Greene has put together and provided on his Trike Asylum blog I figured ‘why bother?’ He has done such an excellent job and thorough presentation that I will just link to it instead. So check out his great article on FAT TRIKES. You might even want to participate in the poll he has there … as to which Fat Trike you would want. Damn the torpedoes, full speed ahead. For those who are after speed … TAH DAH! 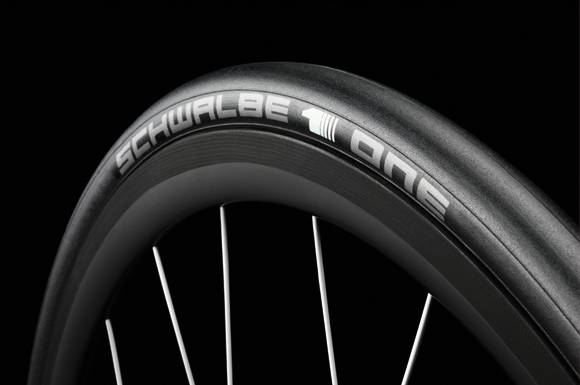 Schwalbe offers their new tire … the ONE. That’s right … Schwalbe One is what they call it. They already offer the Ultremo tire which is a racing tire … fast is the name of the game. The One tire is slightly heavier, but Schwalbe says it makes up for it in lower rolling resistance. And it is more durable and has better puncture protection.They are reported to be “very fast” and as having “very good grip”. Sounds good to me. “Schwalbe One is the fastest and at the same time the most reliable competition tire we have ever produced,” emphasized Holger Jahn, Managing Director Technology at Schwalbe. So now Schwalbe offers the Durano, Durano Plus, Kojak, Stelvio, Ultremo and One to those who are into speed. The One tire is available in traditional, folding and tubeless … at least in some sizes. Schwalbe lists them available in 700, 26 and 20 inch. I find Schwalbe’s website quite difficult to use when it comes to trying to locate their tire offerings. These tires are not inexpensive. The 20 inch 406 (23-406) list price is $72.19, but from the German source I use one can buy 3 tires for $109.63 (including shipping) which breaks down to $36.54 apiece. The only thing is these from this German source are folding type not traditional. Just a side note here — I personally don’t like folding type tires. I equate them with the automotive temporary tires … just something to get the vehicle down the road to a tire store to get the regular tire repaired or replaced. It is quite inferior to the regular auto tire and only intended for temporary emergency use. Folding bicycle tires are quite inferior to most regular tires. They have to be in order to be able to fold. They are okay to carry along in case a tire goes bad and needs to be replaced while out riding … especially on a long journey. Most definitely they are a small size when folded up and easier to carry. Leave it up to man to really confuse things. In the early days of bicycling tire sizes was fairly simple and easy to understand. Have you taken a look at it nowadays? It will give you a headache, I tell ya. I am not going to try to explain it as I don’t understand much about it myself or do I care to try to. What I will do here is provide a link to a webpage where the late Sheldon Brown explains this complicated mess. Along with all the different tire sizes comes the matter of which tires safely fit which rim … which is equally a mess. Forget correct math and common sense and logic. Originally a 26 inch tire measured pretty close to 26 inches on the outside. Of course, that was back when tires were balloon tires. Nowadays it is all different. Oh, there are still 26 inch balloon tires around, but there are so many other sizes as well. Basically as I understand it tires are measured and designated by either inches or metric. The first number is the outside measurement even though it may be much less in reality. I told you it is confusing and a mess. Let’s use 26 x 1.75 as an example. As stated, 26 is the outside height of the tire. Again, it may be in inches or it may be metric. Most of us are familiar with the Catrike 700 model trike. It was named 700 because the rear wheel and tire are 700 mm. 700 mm is taller than a 26 inch tire. 700 mm is 27.5591 inches. 26 inches is 650.4 mm. Got it? A 700 tire is much narrower than a 26 inch tire. That brings me to the next part of this identification and designation process. A second number or letter code would indicate the width of the tire. (26 x 1.75, 27 x 1 1/4…650B, 700C…). To add to the confusion we have fractions, decimals and letter designation. It is enough to make your head spin and give one a headache. And to increase the confusion even more 1.75 is not the same as 1 3/4 in tire sizes. Mathematically they are the same, but that is where it ends. These two tires are not interchangeable. So we need to be careful and know what we are doing when it comes to buying tires and installing them on a rim. The width of a tire is very important and critical when it comes to fitting a rim. I suggest to others that if you don’t know and understand the system in place go to someone who does. Hopefully those working in a bicycle shop can safely and correctly help in this. Just don’t ask me. 🙂 I don’t begin to understand it all. I am satisfied to know what tires my trike takes so that I get the right ones that will fit correctly and are safe to use. By the way, buying inner tubes to fit correctly can be the same challenge. You don’t want a 20 inch 451 innertube as it will be too big in diameter for a 20 inch 406 rim. Always be sure you are getting the right inner tube. I have even had sales people in a local bike shop grab the wrong one off of the shelf even after I told them it was for a 406 rim. Some of them need to be educated as well. I told you it was a real confusing mess! Many of you have probably heard that saying before. Of course, it is in reference to being fat versus being thin as far as our bodies are concerned. And I would imagine an overweight person made it up. And, no, it wasn’t me. But I am not talking about human bodies. I am talking about tires on our trikes. We have a choice, ya know. Some people really go for the skinny ones and some really go for the fat ones. As to which tire we prefer it is, of course, a personal choice and should be based on the kind of riding we do and where we ride. Somebody who rides on pavement and wants to go fast certainly should not choose a fat low pressure tire. Someone who frequently rides off road certainly should not choose a thin high pressure tire. Fat or thin, they both have their purposes and proper applications. A fat tire is superb for off road riding or riding on snow. A thin tire would be horrible for these uses. But if you take a fat tire out onto pavement … well, don’t expect to win any races. And I would rather imagine you would find you would greatly reduce the longevity of the tire doing mostly paved road/trail riding as they just are not designed for that. This is all just common sense stuff. Fat tires are quite expensive compared to most any other tire for our trikes. Of course, they require special wheels which are large enough in width to accept them. The wheels are also quite expensive. The bottom line is … if you have the money you do have a choice. 🙂 Boys with their toys cost money … lots of it. 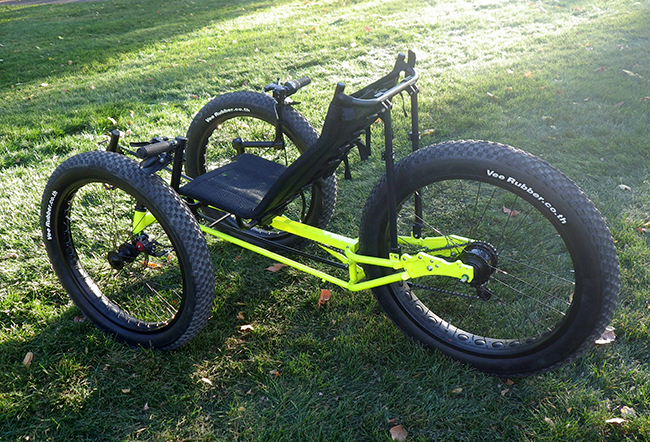 Steve Greene has a great article posted on his Trike Asylum blog about Fat Trikes.